Q10. 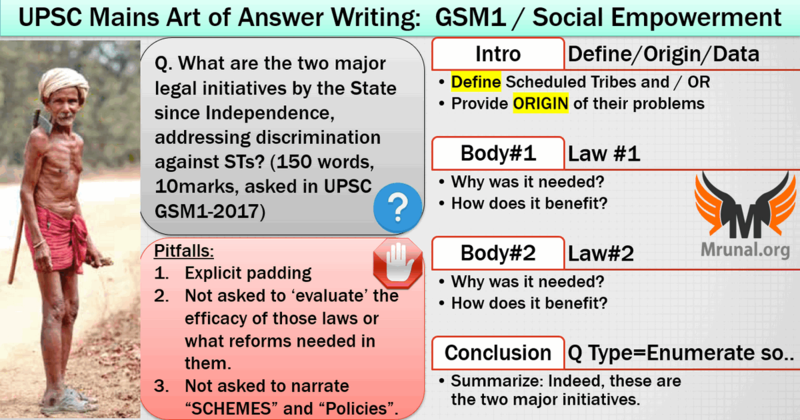 What are the two major legal initiatives by the State since Independence, addressing discrimination against Scheduled Tribes (STs) (150 words, 10marks, asked in UPSC Mains 2017 GS1)? स्वतंत्रता के बाद अनुसूचित जनजातियो (एस.टी) के प्रति भेदभाव को दूर करने के लिए, राज्य द्वारा की गयी दो मुख्य विधिक पहेलें क्या है? It’s a difficult question because if you had to write 4-5 reforms, you could fillup 150 words by writing two lines on each. But you’ve to mention only two reforms, hence for each of them you need atleast 4 lines. Secondly, while describing individual law, again write a preamble / elaborate on why such law had to be made- to pad-up the answer. As such there are three primary ways to introduce an answer: 1) Define 2) Origin 3) Data. You can pad the answer by giving both Definition of ST + Origin of their problems which necessitated the enactment of laws. (Origin of the Problem) Since ancient times, Scheduled Tribes (STs)(#) resided in distinctive habitats in the hill and forest areas. But due to the commercial interests of the British empire, moneylenders and outsiders, their land rights and forest rights were alienated. Consequently, majority of them suffer from the problems of health, nutrition, education and income. (#) When mentioning the abbreviation for the first time, you should give its full form, as I’ve done with the ST.
Special court has to finish the trial within two months. Stringent punishment for the convict. Relief and rehabilitation for victim and his/her family. This act provides 1) individual rights and 2) community rights to the forest dwellers. Forest / revenue officials can neither evict them nor destroy their crop from that particular area. With help of such land titles and agriculture schemes- the STs become less inclined to practice Shifting cultivation (“Jhumming”). They settle down at one place, and thereby further encroachment inside the forest area is prevented. Thus, the act indirectly protects environment and biodiversity. (#) Here often candidates enthusiastically name all the specific Government schemes to padup the answer but it leaves poor impression on the evaluator that “candidate has deviated from the original question, and writing things as if it’s a question about agriculture schemes”. So, just narrate the schemes in generic name. FRA act also provides community rights over the minor forest produce (लघु वन-उपज), pastoral land, fisheries in ponds and other water bodies. This prevents the coaching Forest contractor mafia and feudal elements from exploiting the resources in connivance with local officials. Under FRA, Gram Sabha and its forest rights committee has the decision making power to identify the beneficiaries for aforementioned (1) individual land rights (2) community rights. This also reduces discretion and bribery by Patwari / Tehsildar / Range Forest officer etc. in the implementation of this act. As such FRA act can be summed up in single line: 1) land titles and 2) community rights. 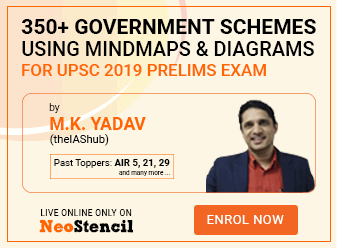 But for padding the answer till 150-250 words, you’ve to elaborate like above- by connecting the dots with land title to agro-schemes and how it helps tribal people. Since independence number of constitutional, legal and administrative initiatives have been taken for the protection and betterment of STs. Among them, the prevention of atrocities act and FRA act can be hailed as the two biggest legal initiatives since the former protects STs from harassment and the latter promotes their advancement by giving them rights over their jal-jangal-zameen (water-forest-land). Conclusion ends at positive note. Don’t insert random thought that ’but these legal initiatives have to be backed with Administrative will of local officials…etc.” UPSC asked you only to enumerate the acts / benefits. UPSC didnot ask you here “to critically examine” to what extent have they improved the lives of STs and what else needs to be done! Above content is ~400 words. But in real exam, you cannot recall that much so automatically it’ll compress down to 150 words. Besides for such small question (150 words), a conclusion is rather unnecessary, IF you’ve covered the matter in sufficient manner in the body itself. I could have used PESA Act [ Panchayats (Extension to Scheduled Areas) Act, 1996]. But PESA only benefits the STs living in the fifth scheduled areas, whereas FRA benefits the ST living in any forest areas (except J&K). So, in terms of “Major-ness” : FRA > PESA. Besides, here examiner asked about “acts against discrimination”, so PESA is poor fitting option in that context as well. FRA fits because STs residing in forest areas were denied land rights unlike the people living in revenue villages, so there is discrimination angle. Ofcourse, FRA is not free of criticism. The act is not implemented in letter and spirit, due to lack of political connivance with mining-mafia and apathy of local bureaucracy. But as said earlier, we’ve to enumerate only theoretical benefits / significance. We are not asked to ‘examine critically’. For UPSC you should prepare current affairs upto 1 calendar year i.e. for CSE-2017, you should prepare WEF 1/1/2016. Atrocity act was made in ’89 but amendment in 2015 and those new features came into effect from 26th January 2016. So, not a random question falling from sky per se. It was in news. Thank you sir , but one calender year means 365 days what you are saying is to read current affairs from jan. of previous year to sept of next year that amounts to 500+ days . Great explanation and minor mistakes which we makes but mentioned and corrected by you helps us to think further and prevent from making these mistakes. I could have concluded in the abnormal way as you have mentioned. So thanks Mrunal Sir. very helpful explanation, extremely beneficial for civil service aspirants !!! video to provide kijiye sir .plz warna free me mare jayenge. Sir what about reservation and section 17 ? These two also a legal steps.